Do you ever struggle find your way around your room at night? As someone who is nearly blind without her contacts or glasses, and not the best night vision on top of it, getting through a dark room can be challenging. While I normally know our room fairly well, it has been a bit of a disaster as of late, mostly due to us rearranging the room, dog crate, and of course, painting materials from an unfinished project (someday I will finish painting!). As part of our rearranging efforts, I decided that we needed a little light in our room, something that was easy to turn on, unique, and wasn’t a distraction if it was accidentally left on at night after reading. As I was looking for the perfect light, we were introduced to the OxyLED Touch Control LED Mushroom Desk Light. When we were asked to review a complimentary lamp, we couldn’t wait for it to arrive! 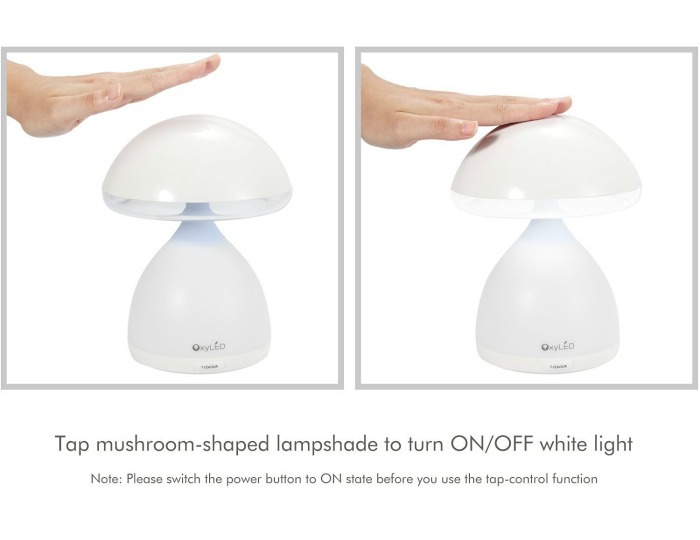 OxyLED Touch Control LED Mushroom Desk Light: What Is It? Looking for the perfect desk light or night light for your bedroom? 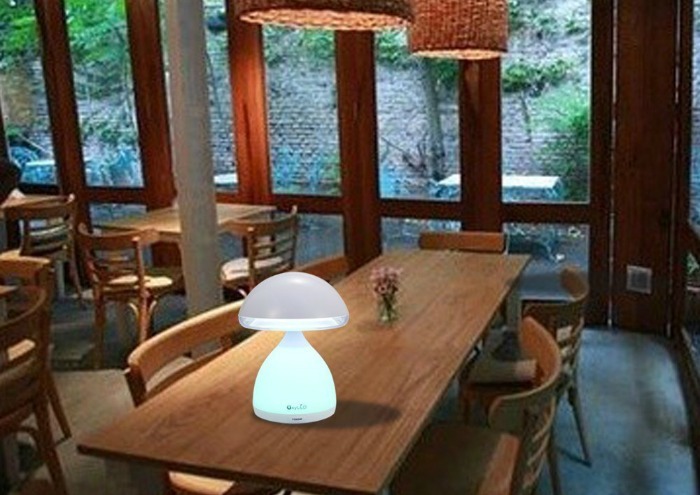 If so, we think you will love the OxyLED Touch Control LED Mushroom Desk Light. This innovative light has 12 LEDS and has a touch control system. All you have to do is tap the lampshade to make the light glow, perfect for needing a light quickly at night. As well, it has 7 color changing settings, making it fun for kids as well. Along with having a cute design, it has a built in rechargeable battery that can be recharged through a USB adapter. In other words, it is perfect for any office, bedroom, kid’s room, or dorm room! When I agreed to review this light, I will freely admit, it was because it was adorable. I loved the cute mushroom design and the variety of colors. The fact that it was also cordless was a big plus, since some of the outlets in our room are oddly spaced, making it very difficult to plug in too much, especially if I don’t want ugly cords throughout the room. 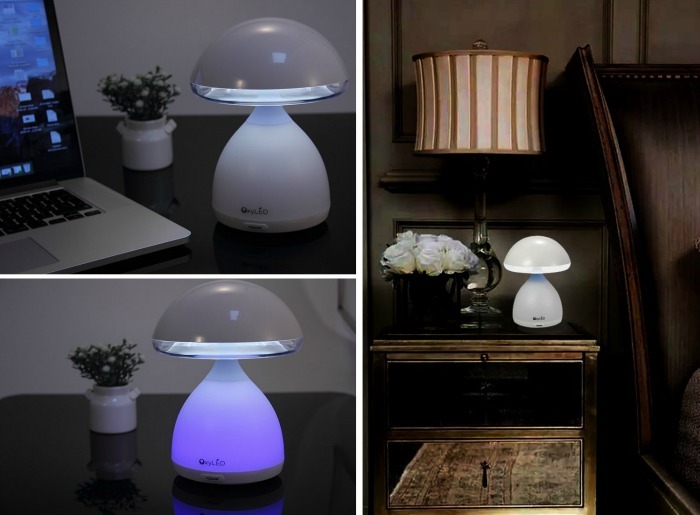 Overall, the light itself is cute and functional, making it a great, quick light at night or on its higher settings, a great night light when we want to read a bit before bed. Overall, it is a great lamp for the money, especially for someone like me who has limited room by our bed. 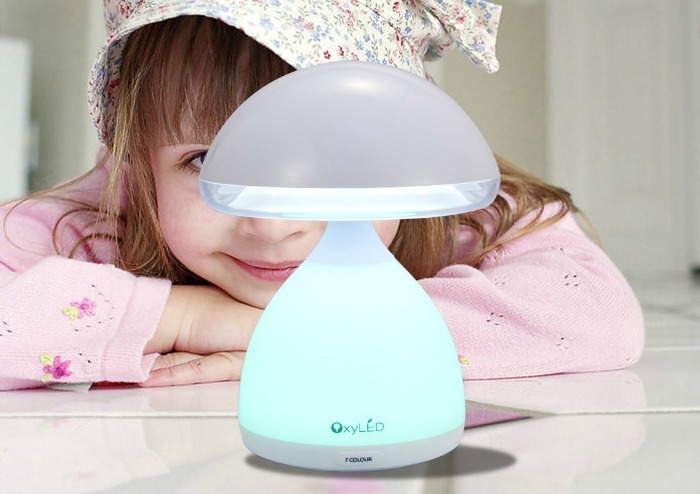 With its great design, functionality, and usefulness, I highly recommend the OxyLED Touch Control LED Mushroom Desk Light to anyone looking for a small lamp for their bedroom. Want to purchase this lamp for yourself? You can buy the OxyLED Touch Control LED Mushroom Desk Light on Amazon.com for only $24.99. My youngest has been asking for a night light. I think this lamp ia a better option. Thanks for sharing. I love these lamps! They’re so cute! this lamp is going to make a great Christmass present this year. wicked neat and serviceable. This is so nice! I was just online searching for lamps, for a table lamp next to the bed, I just crashed and broke mine. Ugh! I love the touch controls! I need a new desk lamp; these look really nice, I’ll have to check them out! Thanks for posting your review! I really like that it’s cordless since where I’d like to put it has no outlets. Love the cool shape of this lamp! My daughter needs a new lamp and I think this would be a great option for her. This is adorable! I love that it’s small and portable! Looks like a fun and practical lamp. They should come out with super and 1-UP mushroom variations. This lamp is so pretty. This would be a fun household accessory to have. The design is very elegant, fun and functional. It’s style is somewhat reminiscent of 1960’s Judy Jetson. This light would be great for my 91 yr. old mama. She has macular degeneration real bad. This would really help her when she gets up at night to get to the bathroom. She wouldn’t have to turn on the overhead light, which blinds you temporarily anyway then prevents your body getting back to sleep easily. I like this design too. I have never seen one like this before, but I am so loving this. This would be perfect for my grandbabies room, I know they are always needing a light and this one being touch, I think will help them out at night more. This Mushroom little desk lamp has Woodstock Peace and Love illuminating from it. I’d like to see Budget Earth have a giveaway for this Groovy Mushroom Lamp. A little goes a long way with the lighting. I could use one of these desk lamps for desk in my home office. I love the design. I’ve been looking for a small table lamp for bedside. I’ve never seen this, but it is adorable! It wouldn’t go with my decor, but I think so many people would grab it if they knew about it.